Maureen Fayle is a Surrey born artist who is largely self taught. She has lived and painted in Devon for the past twenty five years. 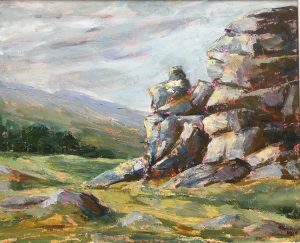 During this time her work has been shaped by the fusion of the barren Celtic landscape of Dartmoor, and her response to the light and colour that is evoked by Devon’s pleated landscape. 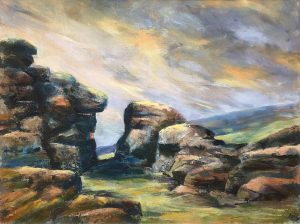 What is discernible in her work is the influence of two of Britain’s most important twentieth century painters, Paul Nash and Graham Sutherland. From the former she has taken the English tradition of deep attachment to the countryside while responding imaginatively to European modernism. From the latter she has absorbed the gift of visual metaphor. She uses semi-abstract patterns of haunting shapes to convey a sense of being in a particular place or the sense of a particular season. 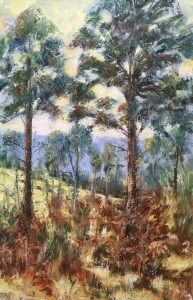 This artist talent has been recognised by both accolades and exhibitions. Her work has been selected for and sold at the Open Exhibition at the South West Academy of Fine and Applied Arts in 2009 and 2010. This was a notable achievement as this institution it lists among its Academicians Mary Fedden RA, Sir Peter Blake RA and Ken Howard RA. In 2008 she was awarded the Judge’s Award for the Best Landscape at the Teignmouth Art Society. She recently received a commission from Weatherspoons to produce three large paintings for the Jolly Breeze in Teignmouth. She has exhibited at the Mayflower Gallery in Tavistock and the Kaya Gallery in Totnes in the past. Currently her work is exclusively being promoted by Wildwood Arts in Horrabridge. In short we have an artist whose use of colour and shape is bold and pure.The clarity and focus of her composition creates a visual feast for the eye. 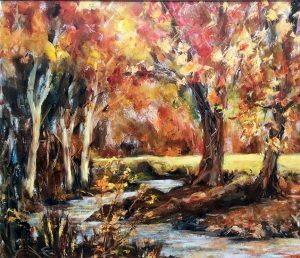 Maureen Fayle is certainly an artist to watch.